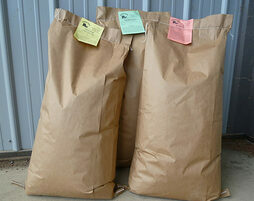 SUNRISE FARM ALL-NATURAL FEED is NON-GMO, and contains NO ADDED MEDICATIONS OR HORMONES. 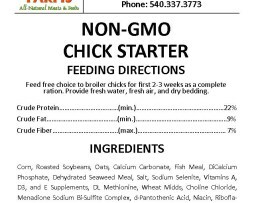 Feed NON-GMO CHICKEN FEED free choice to laying hens 16 weeks of age and older as a complete ration. Provide fresh water, fresh air, and dry bedding. Corn, Roasted Soybeans, Oats, Calcium Carbonate, Dehydrated Alfalfa, DiCalcium Phosphate, Dehydrated Seaweed Meal, Salt, Sodium Selenite, Vitamins A, D3, and E Supplements, DL Methionine, Wheat Midds, Choline Chloride and Citrate, Menadione Sodium Bi-Sulfite Complex, d-Pantothenic Acid, Niacin, Riboflavin, Pyridoxine, Thiamin, Vitamin B12, Biotin, Folic Acid, Polysaccharide Complexes of Iron, Manganese, Zinc, Copper and Cobalt, Yeast Culture, Lactobacillus Acidophilus Fermentation Product, Bacillus Lichenformis, Bacillus Subtilus, Lactobacillus Iactis, Streptococcus Faecium, Protease Enzyme (dried Aspergillus Oryzae Fermentation Extract). If interested, please place an order to get on the list. Feed is delivered every other Thursday. Sorry local pick-up only. Corn, Roasted Soybeans, Oats, Calcium Carbonate, Fish Meal w/ Ethoxyquin as a preservative, DiCalcium Phosphate, Dehydrated Seaweed Meal, Salt, Sodium Selenite, Vitamins A, D3, and E Supplements, DL Methionine, Wheat Midds, Choline Chloride, Menadione Sodium Bi-Sulfite Complex,d-Pantothenic Acid, Niacin, Riboflavin, Pyridoxine, Thiamin, Vitamin B12, Biontin, Folic Acid, Polysaccharide Complexes of Iron, Manganese, Zinc, Copper and Cobalt, Yeast Culture, Lactobacillus Acidophilus Fermentation Product, Bacillus Lichenformis, Bacillus Subtilus, Lactobacillus Iactis, Streptococcus Faecium, Protease Enzyme (dried Aspergillus Oryzae Fermentation Extract). Feed free choice to laying hens 16 weeks of age and older as a complete ration. Provide fresh water, fresh air, and dry bedding. Corn, Oats, Calcium Carbonate, Dehydrated Alfalfa, DiCalcium Phosphate, Dehydrated Seaweed Meal, Salt, Sodium Selenite, Vitamins A, D3, and E Supplements, DL Methionine, Wheat Midds, Choline Chloride and Citrate, Menadione Sodium Bi-Sulfite Complex, d-Pantothenic Acid, Niacin, Riboflavin, Pyridoxine, Thiamin, Vitamin B12, Biotin, Folic Acid, Polysaccharide Complexes of Iron, Manganese, Zinc, Copper and Cobalt, Yeast Culture, Lactobacillus Acidophilus Fermentation Product, Bacillus Lichenformis, Bacillus Subtilus, Lactobacillus Iactis, Streptococcus Faecium, Protease Enzyme (dried Aspergillus Oryzae Fermentation Extract).